American earth land resources satellite. Lewis was selected in the NASA SSTI (Small Spacecraft Technology Initiative) program, along with Clark, to demonstrate advanced spacecraft technologies. Earth observing satellite built by TRW for NASA, USA. Launched 1997. Used the T200B bus. AKA: Lewis;SSTI. Status: Operational 1997. First Launch: 1997-08-23. Last Launch: 1997-08-23. Number: 1 . Gross mass: 288 kg (634 lb). Height: 1.77 m (5.80 ft). In addition to the above instruments, several spacecraft systems technologies were flown. These included a pulse tube cryocooler, a solid state recorder, a fiber optic data bus, GPS attitude determination, a wide FOV star tracker, a magnetically suspended reaction wheel, lightweight structure with integrated thermal control, and a GFRP overwrapped propellant tank. Contract start was 11 July 1994. 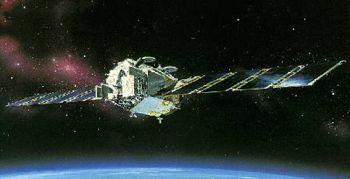 Satellite cost was $ 65 million including the TRW hyperspectral sensor. Athena launch cost was $ 17 million. The launch was delayed from the original 23 May 1997 due to launch vehicle problems. After launch, the satellite was spinning out of control. It lost power due to the solar panels not recharging the batteries. It was declared a loss on 25 August 1997. Electric System: 0.60 average kW. Family: Earth, Earth land resource sat, MX, Sun synchronous orbit. Country: USA. Spacecraft: Athena Mars Flyby. Launch Vehicles: Athena-1, LMLV-1. Launch Sites: Vandenberg, Vandenberg SLC6. Agency: NASA, TRW. Bibliography: 2, 276, 4. 1994 July 11 - . Contract for Lewis satellite issued. - . Nation: USA. Spacecraft Bus: T200. Spacecraft: Lewis satellite. Lewis was selected in the NASA SSTI (Small Spacecraft Technology Initiative) program, along with Clark, to demonstrate advanced spacecraft technologies..
1997 August 23 - . 06:51 GMT - . Launch Site: Vandenberg. Launch Complex: Vandenberg SLC6. LV Family: Athena. Launch Vehicle: Athena-1. Lewis - . Payload: SSTI/Lewis. Nation: USA. Agency: NASA, TRW. Manufacturer: Chantilly. Class: Earth. Type: Earth resources satellite. Spacecraft Bus: T200. Spacecraft: Lewis satellite. Decay Date: 1997-09-28 . USAF Sat Cat: 24909 . COSPAR: 1997-044A. Apogee: 134 km (83 mi). Perigee: 124 km (77 mi). Inclination: 97.50 deg. Period: 87.10 min. Reentered Sep 28.